This is the fourth in a series of articles about several powerful “brain friendly selling” principles that you can incorporate into the structure and content of your sales pitch to make them more effective. The fourth principle is the concept of "contrast". Contrast between what the customer’s current situation is now and what the situation will be like once they have chosen to purchase your product or solution. 1) A summary of their current state or situation, the problems they are experiencing and the costs / impact associated with these. This provides the "Stay Away From Pain" motivation for their brain to be motivated to move away from or avoid. 2) A summary of their desired future state situation that shows the rewards and benefits that they will experience once their problems have been solved by the purchase and implementation of your product or service. This provides the "Towards Reward" motivation for their brain to be motivated to achieve. 3) A positioning that shows your product or service as the enabler that allows them to move from where they are now to where they want to be. A further point of contrast is to demonstrate how you differ from and are superior to your competitors. A good way to find out is to ask your existing customers why they buy from you and the advantages they perceive you to have. What you may think differentiates your organisation might be different to what your customers think! If you ask your key customers what your points of difference are then you will rapidly develop clarity about what they are as common themes occur. You can the incorporate these into your sales pitch. Your message needs to clearly differentiate you from your competitors to provide a strong point of contrast. This is the third in a series of articles about several powerful “brain friendly selling” principles that you can incorporate into the structure and content of your sales pitch to make them more effective. The third principle is the concept of "clarity". It is important to provide your customer’s brain with clarity. To help them make a decision we need to provide clarity throughout the sales process and particularly during the sales pitch. The greater the clarity we can provide the easier it is for their brains to draw conclusions. When we provide the brain with clarity, rather than clutter and confusion, it is far easier for it to process the information it is presented with and make a good decision. Conscious thinking is a complex interaction that includes billions of neurons, and as a result the brain uses a lot of energy when doing it. As a result of it evolving at a time when food could be a scarce commodity, it has evolved to be as efficient as possible and to minimise energy usage where possible. When making decisions, and solving problems, the brain makes heavy use of the pre-frontal cortex. The pre-frontal cortex can become overwhelmed when faced with confusing decisions to make. When faced with such a scenario the brain may avoid making the energy sapping decision or to make an automatic or unconscious choice. This is quicker, easier and uses less energy. The danger is that the automatic or unconscious choice could be to just keep things as they are, to stick with the existing supplier or to procrastinate on making the decision. If you can minimize the energy usage by the pre-frontal cortex you will maximize the energy resources that the customer’s brain has available to make a good decision that will serve them well. Sales people who understand their product or service very well can sometimes, due to their higher level of insight and years of experience, explain things at a more advanced and abstract level than suits a person with less knowledge and experience. When this happens the customer can become confused and feel somewhat bamboozled. Their brain is finding things too complicated and confusing and as a result decision paralysis can result. The variable factors that the customer’s brain has to hold in mind to be able to make a decision need to be limited as much as possible. The “Neuro-Sell” mantra is: Less is more! The customer’s capacity to make a wide decision is limited by the resources available to the pre-frontal cortex. The aim of the “Neuro-Sell” approach is to help the customer by making the buying process as brain-friendly as possible. We can achieve this by providing clutter free clarity to the customer! A good way to provide clarity is to start with where the customer is now. It is a good idea to recognise where the customer is now with their thinking about the topic in question, what they believe and the opinions they have. It is important to make sure that we are “on the same page” as our customer. Showing that we understand their situation and beliefs helps us to build rapport with them. It is good to summarise your understanding and check it is correct with the customer. Getting them into an agreeable frame of mind by agreeing with your explanation of their current context primes their brain to being more receptive to agreeing with your sales proposal. We can then use this current situation or context to demonstrate how we can move the customer from where they are now towards a more beneficial situation. The brain works by connecting new incoming information into existing mental frameworks or maps, so linking your ideas or proposal to the customer’s existing reality will make it easier for them to understand and accept. When people face a problem or challenge they usually attempt to apply strategies that have worked for them in similar situations previously. The customer will be projecting their experience from the past onto the current or future problem / challenge as a way of dealing with it. Their belief about what might work could be a barrier to your proposal being properly considered and accepted. It is usually more effective to meet them where they are currently in their thinking and then build upon this and gracefully move them towards a new positive solution. The first step in making sure the customer has clarity is to be certain you have clarity yourself. That is, that you are able to articulate your proposal in a short, sharp, brain-friendly manner communicating the most important points with impact. A useful framework is to use a technique I was told about by a communications consultant who trained company executives how to make a positive impression when being interviewed by the media. He told me that it was important that they were very clear about the main messages they wanted to get across, and I have found his framework to be very valuable for sales professionals to consider the key messages in selling situations – both in formal pitches and in more informal occasions. You can adapt this to use earlier in the sales process as part of your pitch, and you can also use this to summarise the key benefits or to provide your suggested options. He told me that he uses the metaphor of a house – what he called “the message house”. The “roof” of the message house, contains your most important point. This is a point that you make reference to several times, for example at the beginning, middle and end of your presentation. When building your sales presentation you need to give careful consideration to this message. This message is going to be the number one thing that you want your customer to remember from your presentation. Make your main message orientated around something that provides a strong benefit to the customer. For example, I often use the fact that I have a practical results orientated approach, agree success measures in advance of doing any work for a customer and guarantee to deliver the agreed results. In a nutshell my main message is: “You want improved sales results - I guarantee to deliver them!” As simple as this may sound this frequently provides a point of contrast to my competitors who appear to spend more time talking about the service they provide rather than the results the customer desires. 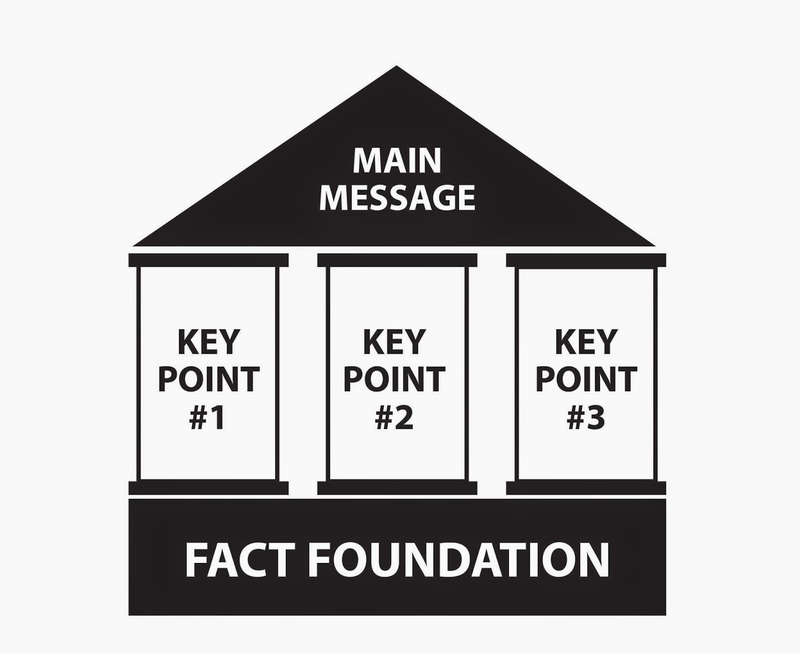 Your main message is then supported by your three key points. These can be, for example, the main three benefits that you can provide. These should link up to and meet the customer’s three most important criteria that you should have identified earlier in the sales process. Due to the limitations about the number of items or chunks of information that can be held consciously at any one time, one main message and three key points is a good number to provide. This number can be processed, understood and decided upon by the customer’s brain. You then need to prepare your “Fact Foundation”. These are facts and proof points that you have ready to prove the validity of your Main Message and 3 Key Points. Although we know that emotion plays a significant role in buying decisions, we still need to have rock-solid proof of the capability of our products and services. Please remember that certain types of customers will need more facts and data as part of their decision making process and there is also a strong emotional benefit to providing this proof as it provides a sense of certainty, reliability and comfort that the brain wants to move towards. Provide your customer’s brain with clarity and it will buy! This is the second in a series of articles about several powerful “brain friendly selling” principles that you incorporate into the structure and content of your sales pitch to make them more effective. The second principle is the concept of "chunking". When delivering your sales pitch clearly outline the process that you are going to follow with the customer at the start of your pitch. Chunk your sales pitch into a series of clear steps and explain these to the customer and tell them that you will be following these steps during the pitch. This establishes a mental pathway which makes your pitch easier for their brain to process. In addition this makes sure that you don't overload the customer's brain and will help to provide it with comfort (an uncomfortable brain never buys) and certainty (an uncertain or confused brain doesn't buy). This chunking process also primes their brain to expect each step (this helps with comfort and certainty) and allows you to stimulate curiosity (as described fully in the first blog post in this series of brain friendly selling tips) by mentioning things that you will be telling them about – only not just yet! Always chunk your sales pitch into bite size chunks and / or simple steps that are easy for the customer to follow and understand. By using the concept of chunking your sales pitch your sales messages will be more easily received, processed and accepted by the buying brain inside your customer's head.